The latest addition to the Port of Wilmington sailed in on Monday, the ir third Neo-Panamax crane. This is part of North Carolina Ports’ $200 million improvement project. Other improvements coming to the Wilmington port include berth renovation and expansion, turning basin expansion and harbor deepening, and expansion to the container yard. 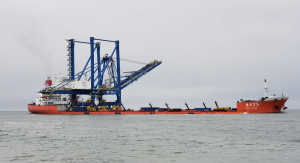 “By adding this capacity – this crane – by improving the berths, improving the facility itself, we’re able to attract services that ultimately will lead to cost savings for our customers,” said Clark.